Here’s a fun trivia question: Who has the fourth-most innings pitched over the past three seasons, behind only Roy Halladay, CC Sabathia, and Dan Haren? Nope, not Cliff Lee or Felix Hernandez. Nor Justin Verlander. It’s James Shields. The Tampa Bay Rays ace has made at least 31 starts in each of his three full major league seasons while completing at least 215 innings, and winning at least 11 games. Shields’ durability would be one thing, but when combined with solid performances — notably by advanced metrics, like Fielding Independent Pitching or even Adjusted Fielding Independent Pitching (both of which attempt to strip the luck aspect out of evaluating pitchers) — Shields becomes one of the better and more underappreciated talents in the league. 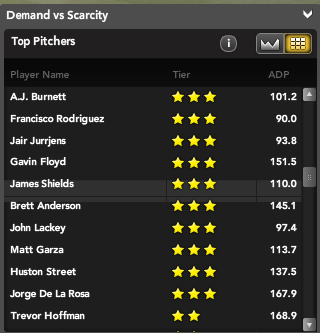 Oddly enough, Shields is actually being drafted well ahead of his 133 B-Rank; his ADP is currently 110. His 2010 Bloomberg Sports projection calls for 217 innings, a 3.89 ERA, 13 wins, and a 1.23 WHIP. That line places him smack in the middle of strong three-star pitchers such as A.J. Burnett, Brett Anderson, and Rays teammate Matt Garza. Shields has the luxury of pitching in front of one of the best defensive teams in baseball, which should help his rate stats. One thing Shields does, perhaps better than anyone else in the division, is mix his pitches. When he came into the league, he was extremely reliant upon a plus change-up. Talk to a handful of scouts during that period and his change-up was right up there with Johan Santana’s for the honor of best in baseball. Since then, though, Shields has continued to add pitches and tweak his arsenal. He throws a cutter now and has a plus curve to go with it. He locates all of those pitches well. Still, the positives far outweigh the negatives. The Rays’ franchise single-season record for wins by a pitcher is 14. With a little help, Shields could break that record this season, and could do so as a strong number-two or number-three option on your pitching staff. 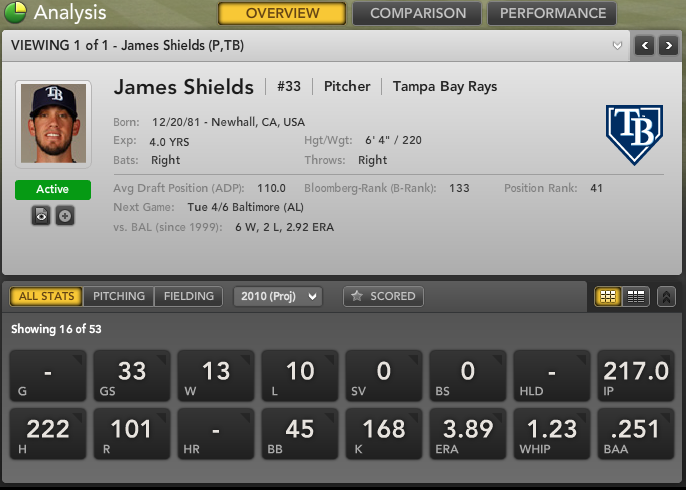 For more on James Shields and other starting pitchers, check out Bloomberg Sports’ fantasy kits. Hereâs a fun trivia question: Who has the fourth most innings pitched over the last three seasons, behind only Roy Halladay, CC Sabathia, and Dan Haren? Nope, not Cliff Lee or Felix Hernandez. Nor Justin Verlander. Itâs â¦ itâs, James Shields. Yep, the ace of the Tampa Bay Rays is pretty consistent. Heâs made at least 31 starts in each of his full Major League seasons while completing at least 215 innings, and winning at least 11 games. Shieldsâ durability would be one thing, but when combined with solid performances â notably by advanced metrics, like Fielding Independent Pitching or even Adjusted Fielding Independent Pitching; both of which attempt to strip the luck aspect out of evaluating pitchers â Shields becomes one of the better and more underappreciated talents in the league. Oddly enough, Shields is actually being drafted well ahead of his 133 B-Rank. His ADP is currently 110. A 23 spot difference means heâs going nearly two rounds earlier in 12 team leagues than Bloomberg projects that he should. Shields isnât pitching too well in spring training, despite a flashy 1.25 ERA. Heâs walked five batters in 14.1 innings and struck out six. Thankfully thatâs spring training, and should be treated as such, if not ignored completely. His 2010 Bloomberg projection calls for 217 innings, a 3.89 ERA, 13 wins, and a 1.23 WHIP. Shields has the luxury of pitching in front of one of the best defensive teams in baseball, which should only help his WHIP and ERA. One thing Shields does, perhaps better than anyone else in the division, is mix up his pitches. When he came into the league, he was extremely reliant upon a plus change-up. Talk to a handful of scouts during that period and his change-up was right up there with Johan Santanaâs for the best change in baseball. Since then, though, Shields has continued to add pitches and tweak his arsenal. He throws a cutter now and has a plus curve to go with it. He locates all of his pitches well, and the only real flaw in Shields game is the lack of run support and home runs allowed. The Raysâ franchise record for wins is 14. With a little help, Shields could break that record this season, and he could do so while being your second starting pitching option.